They were really really easy to make. 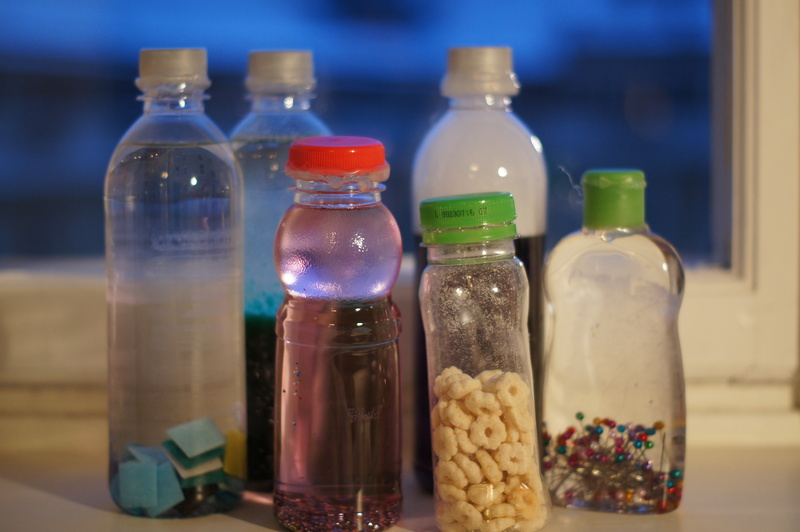 Just fill clean plastic bottles with whatever you want and then hot glue the lids on. We brought out the bottles when Alec and his little friend Sigge were playing together yesterday. Alec is 13 months old now and Sigge is 20 months old. They were both really into the bottles, especially Alec. 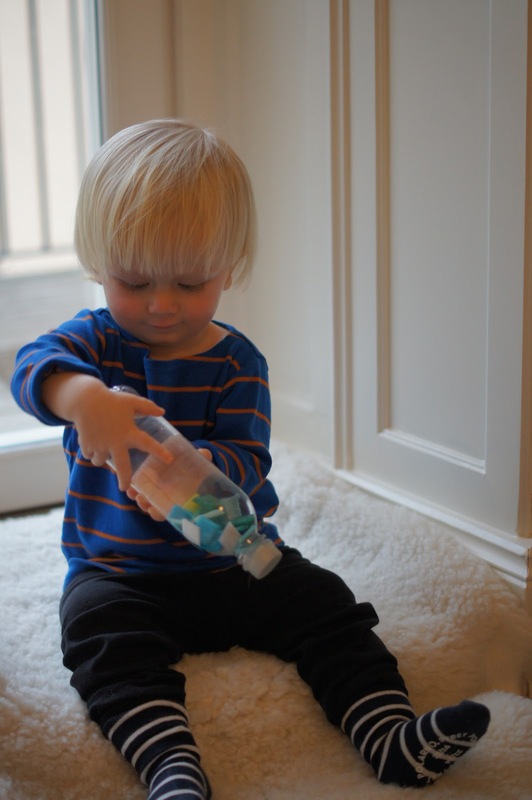 The bottle with the puffs was hands-down his favourite and he has been playing with it since he first got his hands on it. Both of the boys were also very into the mosaic tiles in water, which make an attractive sound when you shake them or roll them across the floor. Sigge immediately put the pins in baby oil bottle in his mouth and then Alec did too. We couldn’t figure out why (neither of them tasted any of the other bottles, and there was no scent or anything on the baby oil bottle to make it especially yummy). Us adults all thought that the baby oil and water bottle would be the most exciting for the kids, but they weren’t too impressed by that one. We did notice that the kids handled the smaller bottles more than the larger ones, so perhaps the bigger ones were too heavy for them to really handle and discover. If you have babies or toddlers at home and are considering this project, I would really recommend it. It’s very easy and fast to prep and the six bottles I made did keep the kids’ attention for quite some time.